Slow start and awkward finish, but the middle was good enough for Washington to beat Colorado and virtually assure an NCAA tournament bid. 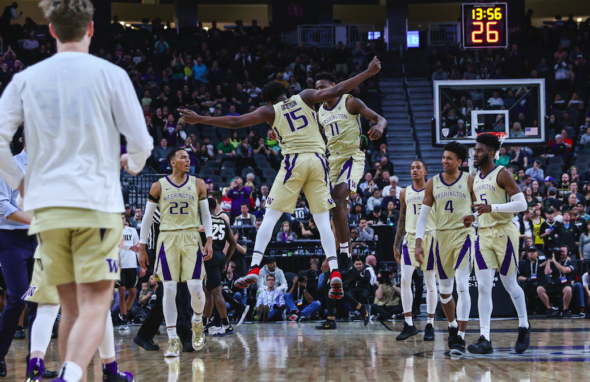 LAS VEGAS – Decades have passed since the Pac-12 has seen the feats Matisse Thybulle and the Washington Huskies have produced this season. The Pac-12 wasn’t even the Pac-12 the last time such things were accomplished. They play Oregon, which had to go to overtime to beat Arizona State 79-75 in the other semifinal, at 7:30 p.m. Saturday for the tourney championship and the league’s automatic berth in the NCAA Tournament. The sixth-seeded Ducks won at Washington 55-47 March 9, but will be playing their fourth game in four days. The Huskies’ 26-7 record after two wins here virtually assures their selection as an at-large entry even if they lose Saturday. Individually, Thybulle has become the most decorated of the Huskies and continues to add to the Pac-12 record book as well as Washington’s. Thybulle’s only steal against Colorado, midway into the first half, led to a David Crisp breakaway. The swipe tied Thybulle for the career conference record of 321 held by Oregon State’s Gary Payton almost 30 years ago. Thybulle didn’t have his best game, fouling out with 3:10 left, but he will have a shot at the outright record Saturday. Washington shot poorly from the field early, then missed six free throws in the final two minutes, but played well mid-game. Unlike the quarterfinal against USC, when the Huskies led from start to finish, Colorado (21-12) scored the first eight points. After that initial burst, the game settled into a back-and-forth contest. Washington rallied to take a 21-18 lead, but the Buffaloes reeled off the next 12 points to claim a 30-21 advantage. The Huskies came back, but a defensive lapse allowed Shane Gatling’s 3-pointer with three seconds left in the half for a 33-27 Colorado lead into the break. The Huskies took control almost immediately in the second half with a 23-5 run as the Buffs missed their first eight shots. For the half, they made six of 30 shots, two of 16 from behind the arc. On the other side, UW finally moved the ball around after the dismal shooting in the first half (10 of 29) , making 11 of 24 in the second half. Still, Colorado had a last run. Up 52-38 with eight minutes to play, the advantage was down to 60-54 when Thybulle fouled out. The Huskies could have made things easier had they made free throws, instead going six for 12 in the final 2½ minutes. Dominic Green did make a pair with 22 seconds remaining for a 64-58 lead. McKinley Wright made a 3-pointer under duress with 15 seconds left, but David Crisp leaked out on the ensuing inbounds play and made an uncontested layup to seal the victory. Jaylen Nowell and Nahziah Carter each scored 14 to lead four Huskies in double figures. Thybulle had 12 points. Tyler Bey scored a game-high 22 points for Colorado. Hopkins used some of his podium time to pitch Thybulle, one of four finalists named this week for the national defensive player award, alongside Duke’s Zion Williamson, Gonzaga’s Brandon Clarke and Virginia’s DeAndre Hunter. Thybulle tied the career mark one night after he became the Pac-12 single-season record holder with five against USC (now 116). That took down the name of another conference luminary, Jason Kidd of Cal, who had held the mark since the 1992-93 season. Thybulle was more interested in the second-half defensive clamps his team put on Colorado. He combined with his coach and Nowell to form the first trio from a single team to sweep the major Pac-12 awards — defensive player of the year, coach of the year and conference player of the year. Thybulle and Hopkins, as repeat winners, became the first player-coach duo ever to win those awards in back-to-back seasons. The last three minutes took forever, and also took two years off of my life.